LAS VEGAS -- It’s the most wonderful time of the year to book a trip to Las Vegas as the destination unveils a robust list of hotel deals and exclusive rates in honor of Black Friday and Cyber Monday. With an abundance of offers to choose from, visitors can start their 2019 travel plans now and ensure Vegas is on their list. Those wanting to book the best rates of 2019 at MGM Resorts’ destinations, including Bellagio, ARIA and MGM Grand, should visit the MGM Resorts website beginning November 20 for the company’s Black Friday/Cyber Monday Week deals for up to 50% off rates. Promotion begins Tuesday, November 20 at 2 p.m. PST and ends Monday, December 3 at 10 a.m. PST. Black Friday Sale: rooms starting at $39 per night on travel Nov. 26 - March 31, 2019. Must book by Nov. 25. Rates are plus resort fees and taxes. Guests may book online or by phone using the code HRBF18P. Cyber Monday Sale: rooms starting at $39 per night on travel Nov. 30 – March 31, 2019. Must book by Nov. 29. Rates are plus resort fees and taxes. Guests may book online or by phone using the code HRCM18P. 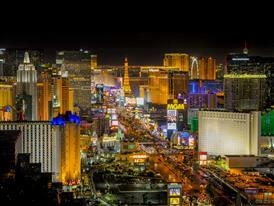 Marriott Hotels of Las Vegas are offering up to 20% off. SLS Las Vegas is celebrating the busiest shopping season by offering the best rates of the year on all room and suite bookings, plus value-added perks that will prove to be too good to pass up by anyone looking to visit Las Vegas. Deal seekers will be able to book online starting at midnight Pacific Standard Time on Wednesday, Nov. 21 until Monday, Nov. 26, 2018. Dates for travel span into next year through March 31, 2019. *two-night minimum stay is required with three-day advance purchase. Rooms are subject to availability and blackout dates. The sale cannot be combined with any other offer and resort credits cannot be used on future stays, are non-transferable, have no cash value and will be applied to the room charge. This offer is not available to groups or persons attending meetings or conventions. Guests must be at least 21 years of age and have a valid credit card authorized as payment of $50 per night for incidentals at check-in. $20-off Reserved level seating for performances through Feb. 10, 2019. Must purchase tickets using link below by Dec. 2, 2018. Subject to availability. $20-off Reserved A level seating for performances through Feb. 10, 2019. Must purchase tickets using link below by Dec. 2, 2018. Subject to availability. Veranda at Four Seasons Las Vegas is offering a Black Friday special for 50 percent off dinner, excluding alcohol, for the month of December if the reservation is made on Friday, Nov. 23. (Offer not valid for Christmas Eve, Christmas Day or New Year’s Eve). On Nov. 23, guests can receive $20 off for every $100 gift card that they purchase. This offer is valid for redemption after Dec. 1 and gift cards must be purchased on Nov. 23. From Nov. 23 – 25, guests who purchase one spa or salon service can get another one for $25 and on Nov. 23, guests can receive 25 percent off full-priced retail products. For more information on ways to save this Black Friday and Cyber Monday, please visit www.visitlasvegas.com.